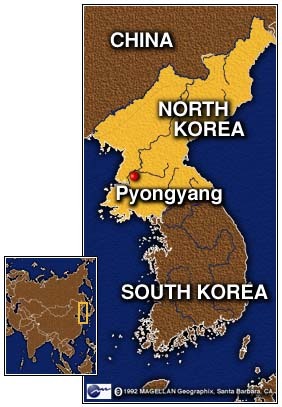 PYONGYANG, North Korea (CNN) -- North Korea on Tuesday declared an end to a three-year mourning period for "Great Leader" Kim Il Sung, but there was no word on when his son and designated successor Kim Jong Il would take over key state and party posts. The younger Kim has ruled North Korea as supreme military commander since his father died on July 8, 1994 at age 82, but he has not assumed the late leader's titles of president and party chief. 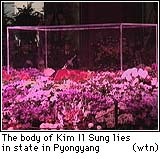 Since his father's death there has been intense speculation on when Kim Jong Il, who is 55, would assume the posts. North Korean officials have said the junior Kim would emerge as their full-fledged leader after Tuesday's anniversary, ending the traditional Korean three-year mourning for his late father. But a South Korean government report, released to the media Monday, said the most likely date Kim would choose to assume full power would be the October 10 anniversary of the founding of the North's ruling Workers' Party, a major holiday. There still is a possibility that the schedule could be delayed until next year because of the North's worsening economic problems and failure to improve ties with the United States and Japan, it said. "The mourning is over," announced North Korean Foreign Minister Kim Yong Nam at a one-hour ceremony on a vast Pyongyang plaza to honor the founding father of the Stalinist state. 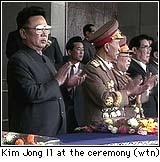 Military leaders and other top figures vowed loyalty to Kim Jong Il as he presided over ceremonies marking the third anniversary of his father's death, indicating he was still firmly in control. Dressed in a high-collared black tunic, he stood expressionless and silently on a podium in front of the former Kumsusan presidential palace, now a memorial hall where his father's embalmed body lies. 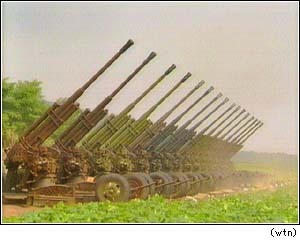 With thousands of other members of the ruling elite, the younger Kim observed a minute's silence for his father, followed by a 16-gun salute from a military honor guard. Kim appeared healthy as he listened to representatives of the Workers' Party, government and military hailing him as leader. He did not make a speech. The nation over which the younger Kim presides is in deep trouble. The economy is in shambles. Acute food shortages produced by years of socialist mismanagement and two successive summers of disastrous flooding, have created near famine conditions in some parts of North Korea. Harrowing images of malnourished children and barren fields have become increasingly common. It is much less clear whether the food crisis will lead to a broader political crisis. Some analysts, though, argue that that Kim Jong Il's failure so far to take his father's jobs does not mean he is not in charge. For one thing, his appearance at Tuesday's ceremony points to continued preeminence. In addition, there are signs of at least some degree of policy-making coherence at the top, notably North Korea's continuing adherence to a 1994 pact with Washington freezing its nuclear program and its recent decision to join the United States, South Korea and China to discuss a long-term peace agreement for the divided peninsula. Still, the North Korean leadership has been rocked by the defection of a top official to South Korea earlier in the year, and by its inability to alleviate the food shortages, leaving the real situation in the isolated and secretive nation still something of a mystery. Correspondent Mike Chinoy and Reuters contributed to this report.